We have two types of sealers that offer a “cut” option: a cut and seal sealer (aka a sealer with a round wire) OR a sealer with a sliding cutter. Please take a look at the two options to determine which sealer works best for you. If you have questions, please contact us or one of our distributors! A seal and cut sealer is most often used in shrink wrapping film and bags. When using a seal and cut sealer, any excess material above the seal is cut off creating a clean seamless seal. When purchasing a seal and cut sealer, ask for an impulse sealer with a ROUND wire instead of a flat wire. Flat wire sealers create seal widths such as 2mm, 5mm, or 10mm seal widths. Round wires create no seam. If you already have a 2mm sealer, you can easily purchase a round wire heating element and convert your sealer to a cut and seal sealer. Please note: ONLY 2mm sealers can be converted, a 5mm or 10mm sealer CANNOT be converted to a round wire. See our instructions on how to change your heating element wire. 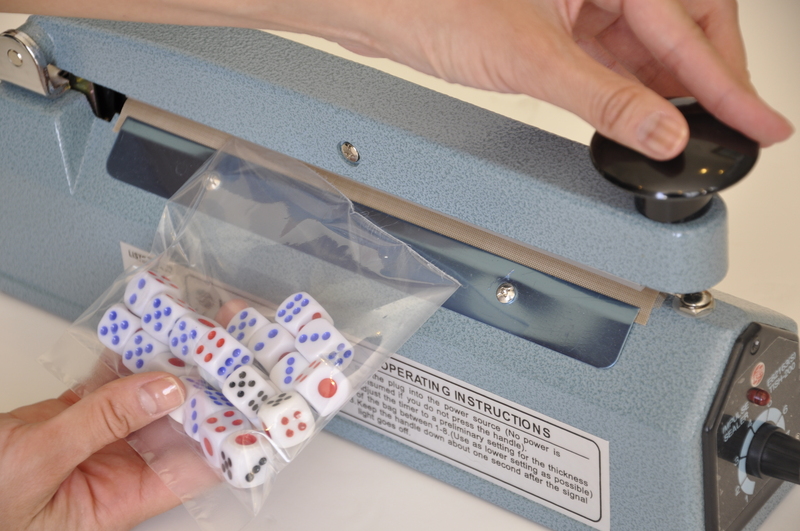 Now, a sealer with a sliding cutter is most often used to trim a bag length or seal poly tubing. A sealer with a sliding cutter is equipped with a blade which will cut any excess material about 1/4″ from the seal line. We carry sealers with cutters in a 2mm and 5mm seal width. We recommend using a 2mm for sealing materials 3-5mil thick (6-10mil total) and 5mm seal width for sealing materials 6-10mil thick (12-20mil total). This entry was posted in Hand Sealer, Uncategorized and tagged Hand Sealer, Hand Sealer with Cutter, Heat Sealer, Heating Element, Impulse Sealers, Round Wire, Sealer Sales. Bookmark the permalink. Great informations on sealer. I am currently doing some research and found exactly what I was looking for. Thanks for guide! Great! Please let us know if there is anything else you need!! My unit quit. I laid it up a while. No light comes on at all. The switch under the arm hinge looks like it deteriorated and a part fell off it also. And I also used it until the tape on top burned thru but it worked when i laid it up.I need the tape and wire parts for sure. What could be my problem??? Hi Mike, Thanks for your inquiry. This sounds like you may want to replace the microswitch on your unit. If you want to provide me with your model #, we can find the appropriate microswitch for you. I need to seal something which has 210 C glass transition temperature and I want to be 40 C below that temperature. My TISH -100 sealer has 8 different options for its power setting. May I ask what is sealing temperature for each of those options? I have a KF-400h, it keeps blowing the heating elements as soon as the micro switch in activated, and the only physical sign is the wire of the heater transformer is melted…. seems like the heater transformer is putting out too much current. Thanks for your inquiry – one thing you may want to check is the PTFE adhesive under the heating element. Make sure that you have replaced it with a new PTFE adhesive. An impulse sealer’s PTFE adhesive serves as a barrier between the heating element and the sealer’s body. When the sealer’s heating element has burned through the bottom PTFE adhesive and arc’ed on the sealer’s body, the heating element will break and may also damage the timer. We haven’t bought our sealer yet, i’m hoping you can help us. I’ve seen that the teflon or PTFE leaves a pattern to the seal, we want the seal to be smooth. Can i replace the material that is sent with the sealer with a smooth surface teflon strip? Hello Mike – Usually the seal smoothness is based on the silicone rubber. If you let us know what sealer you are looking at, we can add a PTFE adhesive on top of the silicone rubber and test the seal on your material to see if you like the look of the seal? or can i buy it from you with smooth PTFE adhesive on top of the silicone? thanks, the original reply from Sealersales, 09/03/18 at 3:21, stated “we can add a PTFE adhesive on top of the silicone rubber and test the seal on your material to see if you like the look of the seal”. Can you supply the PTFE adhesive? i tried to find some on line, and was not sure what to get.